Habit: Annual, perennial herb, generally forming mats, glabrous, internal air cavities evident; caudex generally 0; rhizomes generally evident, long, scaly, bulb or tuber at tip generally 0. Stem: simple, generally erect, smooth, generally not hollow; tip generally not rooting. Leaf: 2, basal, blades 0 or tooth-like, <= 1 mm. 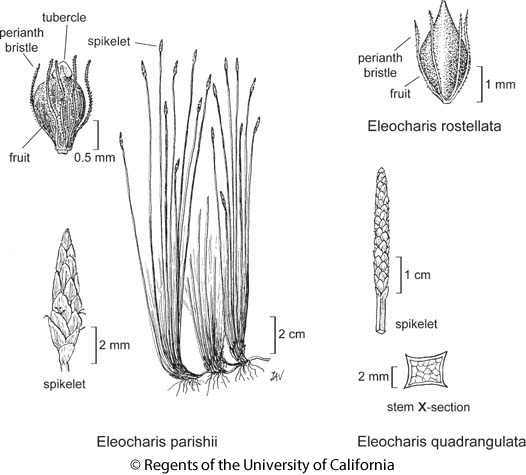 Inflorescence: inflorescence bracts 0; spikelet terminal, 1, generally ovate, not +- flat [(+- flat)], generally not forming plantlets, flowers 3--100+; flower bracts spiraled [(2-ranked)], each with 1 flower in axil, generally ovate, generally brown, generally membranous, smooth, tip generally acute to obtuse, notch 0; basal flower bract generally encircling stem, generally < 1/2 spikelet, flower generally 0. Flower: bisexual; perianth parts reduced to bristles, 0--8, generally +- <= fruit, barbs generally recurved; stamens generally 3; style 1, thread-like, base enlarged, generally persistent on fruit as tubercle. Fruit: generally obovate, generally brown; tubercle (0 or) generally distinct, generally pyramidal. Species In Genus: +- 200 species: tropics to boreal. Etymology: (Greek heleios, dwelling in a marsh, and Charis, grace) Note: Eleocharis lanceolata Fernald, Eleocharis equisetoides Torr. not in California. Habit: Perennial herb 10--50 cm; rhizome 0.7--2 mm diam, tough. Stem: 0.2--1 mm diam, +- cylindric or +- flat. Leaf: distal sheath firm, persistent, tip subtruncate to subacute, some or all with tooth to 1 mm. Inflorescence: spikelet 3--20 mm, 1.5--2.5 mm wide, narrow-lanceolate or cylindric; flower bracts 15--40, 2--3 mm, tips rounded to acute, not transversely wrinkled, not recurved. Flower: anthers 1--2 mm; stigmas 3. Fruit: 0.8--1.4 mm, 0.5--0.7 mm wide, 3-sided, smooth or minute-net-like; perianth bristles 3--7, vestigial to +- exceeding tubercle. Chromosomes: 2n=10. Ecology: Locally common. Fresh streams, vernal pools, foothill and riparian woodland, pine forest; Elevation: 500--2300 m. Bioregional Distribution: KR, NCoRI, CaRF, n SN, c SNH, s SNF, GV, SnFrB, SCoRO, SCo, WTR, SnGb, PR, GB, DMoj, w DSon; Distribution Outside California: to Oregon, Kansas, Texas; Mexico. Flowering Time: Late spring--fall Note: Some plants resemble Eleocharis montevidensis. Citation for this treatment: S. Galen Smith 2012, Eleocharis parishii, in Jepson Flora Project (eds.) Jepson eFlora, http://ucjeps.berkeley.edu/eflora/eflora_display.php?tid=23997, accessed on April 19, 2019. KR, NCoRI, CaRF, n SN, c SNH, s SNF, GV, SnFrB, SCoRO, SCo, WTR, SnGb, PR, GB, DMoj, w DSon; Markers link to CCH specimen records. Yellow markers indicate records that may provide evidence for eFlora range revision or may have georeferencing or identification issues. Purple markers indicate specimens collected from a garden, greenhouse, or other non-wild location.